Pigeon and I are on vacation in Massacusetts. This is the state where I was born. It is located on the eastern seaboard of the USA. If you look at the map, you will find Massachusetts colored green on the upper right side of the map above Connecticut and below Maine and New Hamphire. Massachusetts is about 3,000 miles from Seattle. 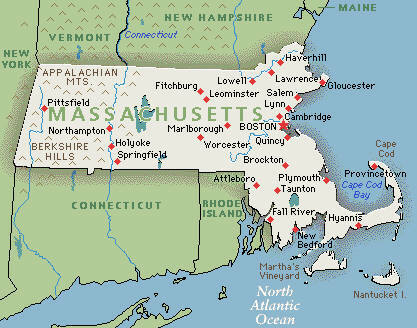 Here is a map of Massachusetts. It is not a very big state in size. I first flew into Boston. My next stop on the trip will be Maine. 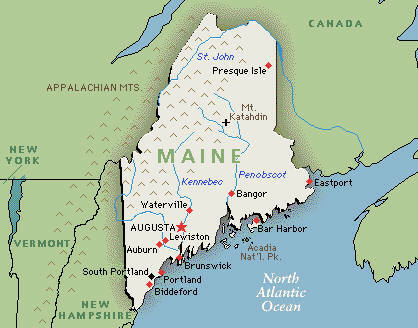 Maine is the most northeast state in the US. The unfortunate part of being on a trip is having computer problems! Pigeon and I have taken lots of photos, but we will have to wait to show them off until we get back from our trip. Until then enjoy the last weeks of your summer vacation and Keep Reading! Have you ever been to Massachusetts or Maine? What did you do? What kind of vacation trip is your favorite? This entry was posted in Library News, Summer Reading Contest 2011, Uncategorized by Mrs. Hembree. Bookmark the permalink. Dear Mrs.Hembree, So how was Massachusetts? I have not bin in Massachusetts but yesterday I went on the ferry because my mom and dad herd that there would be sea snails,big sea sails and clams so that is way we went on the ferry.I went with my family and Tracy’s family. After we finish calming we went the the ferry you have to wait for 10 minutes to get in the ferry.It was a fun trip. From Alex. P.s. What happen to the day where we have to go to meet our teacher for 2011 to 2012? Tell me what in the tar nation happen???? Hope you both are having a great time at Massachusetts. I did not know you were born in Massachusetts! Every year my family and I go to Albury Wodonga in New South Wales and it is such a fun trip becasue I have my cousin in the car with me. Each time we get tried while sitting in the car Kayla and I say Jimmy Jam which I made up wake we are all most there. It take 3 hours to get to Albury from Geelong. We go to the Siesta which is a Mexiacn Place. Albury is on the border of New South Wales and Victoria. You are certainly clocking up the kilometres in your travels! Quite a few families from our school have travelled to the USA this year and they have had wonderful holidays. My favourite holiday was when I spent 8 weeks in a Mack truck travelling and camping down the East Coast of Africa. I have never been to the USA….maybe one day! What did you like about best about growing up in Massachusetts? We have moved into our new LRC while you have been travelling! Traveling around New England is very fun because there is so much to see. I especially like driving along the coast and seeing the beaches and lighthouses. I hope you have had a great summer! School starts soon! Are you ready to be a 3rd grader? Sounds like you and Pigeon are having an awesome time travelling around your home town. I would love to know more about your home town. What makes your home town so special Mrs Hembree? I, love to go back home for me it is in the Snowy Mountains in the High country. As a matter of fact I am going home to the HIgh country for a school re union in October. Can’t wait to see some photos of you and Pigeon. Thank you again for commenting on our blog! I am home now and have many photos that to post. I think I will have to make a movie of them all! Soon we will be back to school and our summer vacation will be over. It was wonderful traveling around the area where I grew up. Did you grow up in a different area of Australia? Dear Mrs.Hembree, So have you ever bin in downtown Seattle? You wounder where is down town Seattle. I wish you can come because this this Saturday I am going to downtown Seattle because they have a fair where there is music,bounce house, Veitnam foods and toys. It also has a playground I think. You student Alex. Yes I go to downtown Seattle pretty often. Did you have fun at the fair? Did you eat anything really great? I just received your postcard and I was so excited I put it with Mrs Yollis’s postcard. Thank you, Thank you so much for sending me a postcard it really made my day. PS Thank you so much. I am so glad you recieved the postcard! I am back home now. Soon I will post new photos from my trip, so I hope you will check back soon. It sounds like you are having a wonderful summer! Fantastic! I cannot wait to see pictures and hear all about it. You mentioned that you were going fishing and were going to trap lobsters. How did that go? My summer has been tremendous. You went east to the Atlantic Ocean, and I went west on the Pacific Ocean! Getting a chance to swim every day with tropical fish and turtles was amazing. I have a few movies about them on my blog, and have one more to publish with some fish movies. We start school in less than a week, but I am getting ready. When do you move back in? I remember you had to box everything up in June! We have both had a great vacation haven’t we? I am working on my movie of our travels today and will post soon. I will definitely check out your fish photos today. I didn’t have any internet access for most of my vacation, so I haven’t seen most updates to my favorite blogs! I wish you a wonderful start to your year. We don’t start school until after Labor Day. I won’t have access to our campus until the last minute. Our students may be helping me unpack as part of our September lessons! A perfect, hands-on way to learn the Dewey Decimal System. What do you think? Should I have them help me unpack? Enjoy the last days of your vacation! Sorry not writing back to you sooner. To answer your question I did half of my younger years growing up in Melbourne. Then my dad/mum decided to buy a farm near the Snowy Mountain which they both did and so I did the next chapter of growing up on the farm. As a matter of fact I have been invited to attend a school reunion soon which will be fun. Country life really is a wonderful life as it really is one big family. When I read that you grew up near the Snowy Mountain, it reminded me of the movie Man From Snowy River. It’s an old one, but I just watched it again a few weeks ago! I grew up in the country too and remember relaxing in the cow pasture, watching the clouds float by and deciding what they looked like! Yes, it’s a different way of life. I went to the same elementary school as my uncle and mother. I also had the same Physical Education teacher and 4th grade teacher as my mother!